Thank you so much for your kindness and professionalism in helping us make final arrangements for my cousin, Bill. 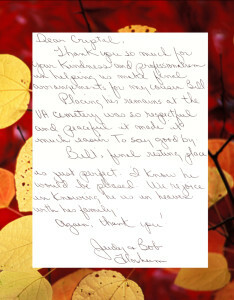 Placing his remains at the VA Cemetery was so respectful and peaceful it made it much easier to say goodbye. Bill’s final resting place is just perfect. I know he would be pleased. We rejoice in knowing he is in heaven with his family.